Social media remains a critical method of spreading the word about your business, no matter what kind of business it may be. In fact, an infograghic compiled by Udemy shows how marketers use social media to get potential customers talking about their products and services. The most popular social channels for marketers in the U.S. have been Facebook, Twitter and YouTube, the Udemy infographic indicates. So how can your business use social media to spread the word about what you do? See how five diverse businesses use social media for growth, to effectively spread messages in different ways. Seamless is an online service that helps customers order food from local restaurants. The site features 12,000 menus and discounts, deals, and new restaurants are added continuously. The site has created huge social media followings on multiple channels with a simple “Let’s Be Friends” social app on it landing page. The feature has helped Seamless amass more than 338,087 fans on Facebook and 72,611 followers on Twitter, and 1,898 +1s on Google Plus. What’s more, Seamless gives customers a reason for following. The site’s Facebook presence (pictured above) includes an “order now” page, tabs for monthly sweepstakes, a referral program, a hiring page, a dedicated video page, and a download page for the site’s mobile apps. Of course, you don’t need to be a tech firm to take advantage of the power of social media to market your business. The Mermaid Inn and Mermaid Oyster Bar with three locations in Manhattan, demonstrates how a brick and mortar business can use the power of social media effectively. The restaurant uses embedded YouTube videos by executive chef Lawrence Edleman who offers a “cooking school” showing how to prepare some of The Mermaid Inn’s seafood recipes. The business also actively promotes its brand on Tumblr, Google Plus, Twitter, and, of course, Facebook, where the gallery section is used to display an assortment of restaurant favorites. A tobacco company may not be the most glamorous brand to market these days. But small independent Hestia Tobacco has use social media to put a new spin on old and sometimes unpopular product. In fact, so unique is the tabacco company’s approach, that it earned a write up from Crain’s Social Media Group a division of Crane Communications, a leading business publishing company. The company’s Facebook fan page is a doorway to its whole social media presence. Not only does the fan page feature a gallery of images including the company’s creative logo. But the page links directly to Hestia’s Twitter and Instagram feeds as well, allowing social media followers to navigate easily through all the various channels finding the content that appeals to them the most. Branch is a startup business that doesn’t simply use social media to promote a product or service. It uses social media conversations themselves as the products or services. Here’s how. The new social site lets you sign in for an account or simply use your Twitter sign in and then begin a conversation with others on Branch. The site allows groups divided into categories like customers, experts and communities give feedback to larger brands. 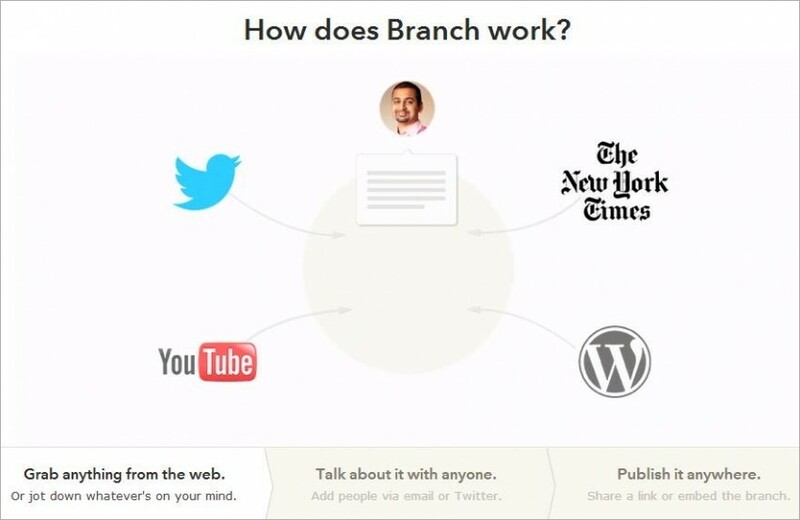 Users simply take content from anywhere on the Web — be it a YouTube videos, story in the New York Times or a blog post on WordPress and start a conversation a conversation about it on Branch. These conversations can then can be “published” anywhere by providing a link or embedding the conversation or “branch” on another website or blog. Social media can help you grow your business in many ways. Here are four goals to help you boost your social media efforts big time today.